In a large, sturdy pot, melt butter on stovetop over medium heat. Add onion and sauté until translucent, about 4-5 minutes. 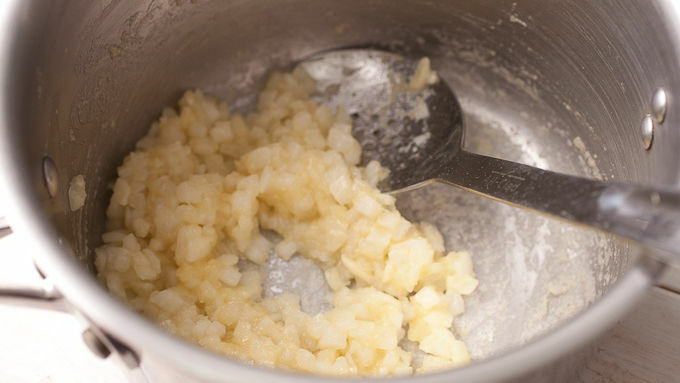 Stir flour into the onion mixture and continue to cook for a minute or two to form a roux. Gradually whisk cream and broth into the mixture, adding slowly so clumps don’t form. Add chopped broccoli and carrots to the pot. 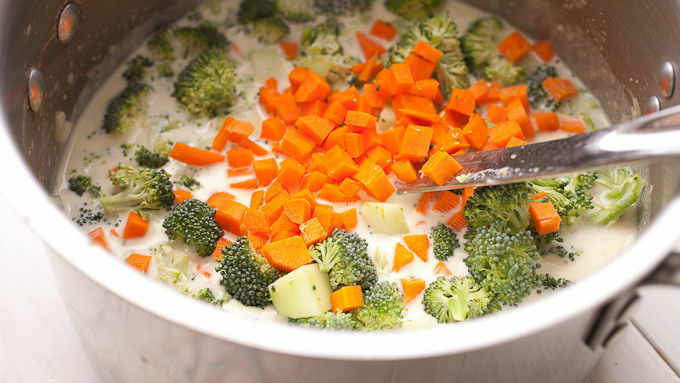 Bring the soup to a slight simmer, cover, and continue simmering for 20 minutes until broccoli and carrots are tender. Add cheddar cheese to the soup and season with salt and pepper. Keep warm until ready to serve. Serve with Pillsbury crescent rolls for dipping. Next time you get that soup craving, just make it at home. 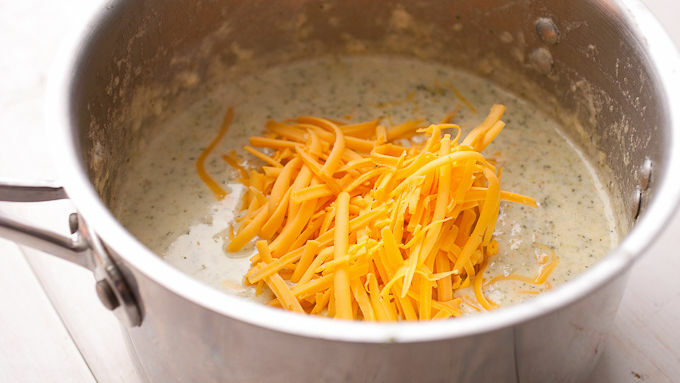 If there’s one soup I crave as we get closer to fall, it’s a good broccoli cheddar soup. For some reason the combination of creamy broth, fresh broccoli and cheddar cheese really hits home for me. I have zero problem making an entire meal out of a soup like this. 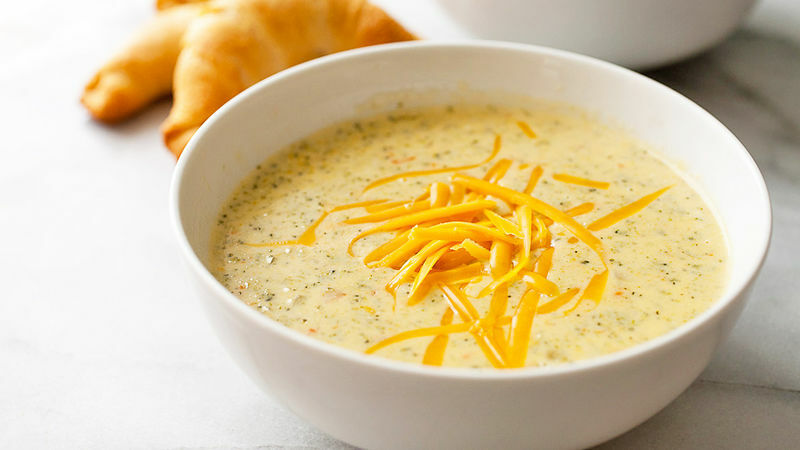 One place that makes a very good broccoli cheddar soup is Panera Bread™—it’s one of my favorite things on their menu. So of course, I had to try recreating it at home. I don’t know exactly how they make it, but this from-scratch version is pretty darn close! If you’re a fellow fan of Panera’s broccoli cheddar soup, you’ll want to make this all season long. Personally, I like to blend my soup so it’s nice and smooth, but you could leave it chunky if you want. You can also do half and half so you still have some chunks. It’s your call! I like to serve this soup with a side bread like Pillsbury Crescent rolls for dipping (okay, and cleaning out the bowl). Grab a spoon and dig in!